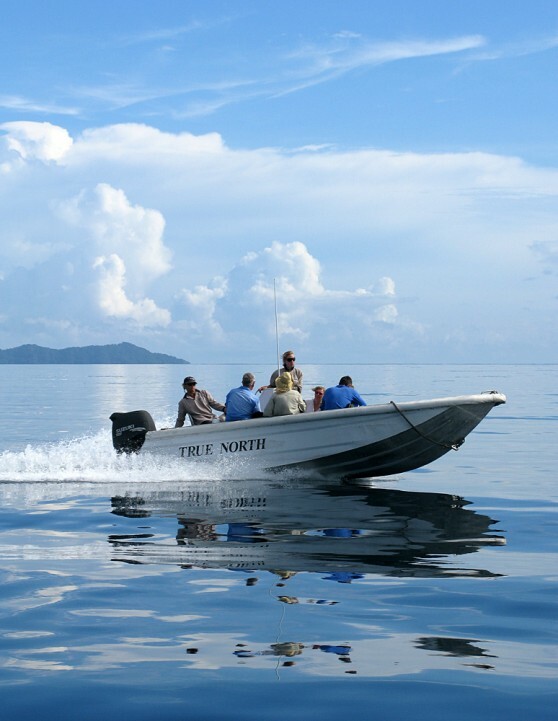 The TRUE NORTH first visited untamed Papua New Guinea in 2005. 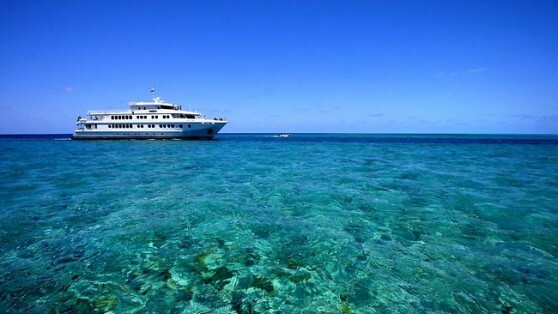 Since then, undiscovered West Papua has been added to the sailing schedule and itineraries have been continually refined to ensure that they are filled with only the highest quality experiences – the highlight being countless encounters with the overwhelming hospitality of those who are fortunate to call these untouched paradises home. 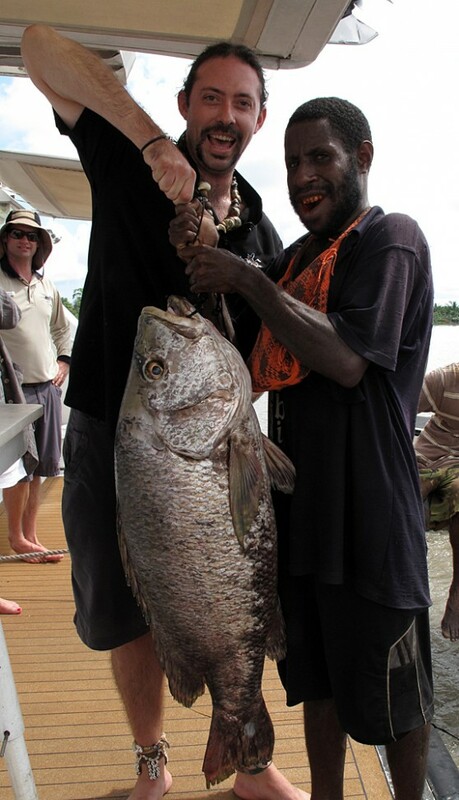 Read an interview with Nathan Sharpe about his trip to PNG on True North. This cruise is our most refined Indo-Pacific voyage, packed with diverse destinations and fascinating experiences. From the Bismarck Sea to the beautiful Louisiade Archipelago, our track takes us through a stunning tropical landscape of islands and reefs. Have the opportunity to fly in the ship’s helicopter over the active volcano at Rabaul, and visit the stirring Isurava memorial on the Kokoda Track. Our Melanesian friends greet us with the warm hospitality accorded returning family, and the smiles and laughter of the children will leave lasting memories of this modern-day Adventure through Paradise. Our Sepik Soirée cruise is a voyage of stunning contrasts, from the freshwater lakes of the mighty Sepik River, to the turquoise blues of Hermit Atoll, and the towering jungle volcanoes at Bagabag Island. We take True North over 100km up the Sepik River to visit the stilt-villages of the Kambaramba lakes region, where whole communities live suspended above the water. Collect an original art-piece at the vibrant Angoram carvers market, meet the Polynesian seafarers at Ninigo atoll and listen to the thunder of the split-log drummers and dancers at Manus Island. 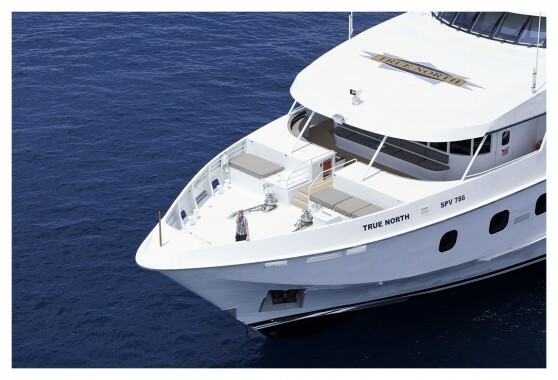 From Kavieng to Madang, join us aboard True North as we circumnavigate the Bismarck Sea in style on this voyage of a lifetime! 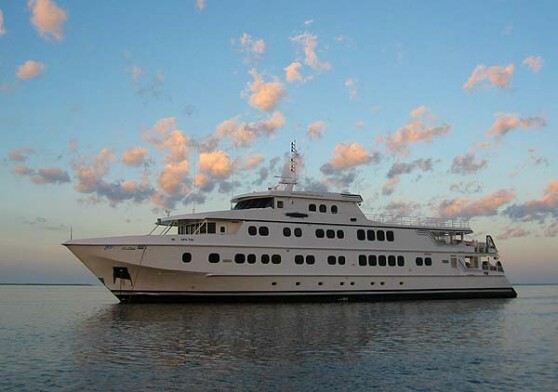 Our Bismarck Bonanza (Sepik Soirée) cruise is a voyage of stunning contrasts, from the freshwater lakes of the mighty Sepik River, to the turquoise blues of Hermit Atoll, and the towering jungle volcanoes at Bagabag Island. The Bismarck Sea lies in the centre of the famed Coral Triangle, the snorkelling and dive sites offer extraordinary water clarity and a kaleidoscope of fishes and corals. 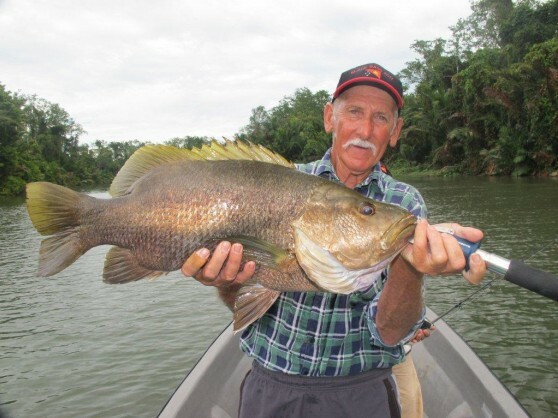 Sport fishermen will share the excitement, with regular hook-ups on sailfish, black marlin and wahoo in the blue water, as well as the chance to toss lures for Papuan Black Bass. From Kavieng to Madang, join us aboard True North as we circumnavigate the Bismarck Sea in style on this voyage of a lifetime! Our voyage of discovery to West Papua takes us through the majestic Raja Ampat Islands just off the western tip of New Guinea. Revered by divers, these reefs are the global pinnacle of marine biodiversity. A riot of colour and movement, the reefs here will amaze even the most seasoned underwater explorer! Equally impressive is the topside scenery, from the volcanoes and nutmeg plantations at the spice islands of Banda, to the jungle waterfalls at Sebakor Bay, and the maze of karst beehive islands at Wayag. Join us on an expedition to the Tamulol cave at Misool, see the dawn display of the Red Bird of Paradise at Gam Island, and snorkel the stunning tropical fjords at Waigeo. True North is the perfect platform to enjoy a modern day expedition through West Papua, and we look forward to sharing our experience of this outstanding wilderness area with you. West Papua is the last frontier of the Indo-Pacific, and deep in the heart of this flourishing equatorial wilderness, lies a biodiversity hotspot – Cenderawasih Bay – the Bay of the Birds of Paradise. 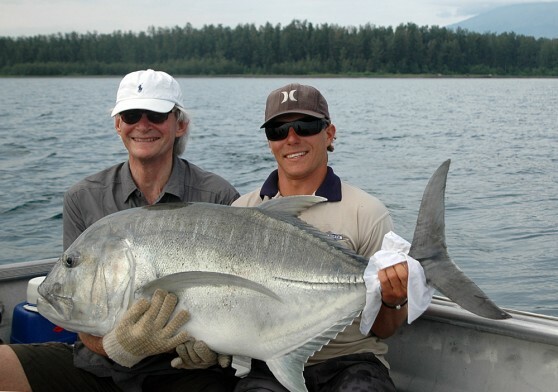 Our newest cruise offers a marine megafauna experience like no other, a chance to observe the biggest fish in the world in a fascinating symbiotic interaction with traditional fishermen. Whale sharks gather each morning in October to be hand-fed sardines, begging like giant dogs before inhaling bucketful’s of the small fish. Our guests snorkel with these gentle leviathans for hours, enjoying spectacular close encounters and gaining a rare insight into the ecology of these enormous creatures. While this is a cruise highlight, the voyage around the northern coast of West Papua offers a great deal more, with exotic Islands, stunning coral reefs, and fascinating cultural interactions with the indigenous Melanesian people. We look forward to your company aboard True North as we continue our exploration of this unique tropical ecosystem. The Louisiade Archipelago is one of the great island arcs of the South Pacific, stretching some 400km along the northern rim of the Coral Sea. A wonderland of hundreds of islands, lagoons, and extensive barrier reefs, this remote area is the home of the seafaring Dobu people, and boasts some of the best diving, snorkelling and fishing to be found in PNG. See the Japanese Zero wreck at Deboyne lagoon, swim with Manta Rays at Losai Island, and finish the day with a drift snorkel among the huge trevally at Nivani Pass. Sport fishermen can expect to tangle with sailfish, Spanish mackerel and giant dog-tooth tuna, while the postcard-perfect beaches and islands will inspire the inner photographer. The view from the sky is extraordinary, and our helicopter flights over the Calvados Barrier Reef and Misima Island will mesmerise with vistas of emerald islands in a cobalt tropical sea, a perfect reminder of this Archipelago Adventure aboard True North.